When planning the 100th post we ended up talking about the lack of time for the Hobby. Most of you can relate to the challenge of planning modeling time so that it will fit in with work, family, and sports. This bundle of curiously evolving activities we call life has a habit to sometimes make it very difficult to keep consistency in artistic endeavours. Personally my situation is still quite okay. Being a postgraduate student I can pretty much make my own schedules, and I live with an extremely understanding girlfriend. But throw in the severe lack of space for someone with very low income living in west London, and things get challenging. And challenging is nearly always just a variation of interesting. For a long time my ‘excuse’ to not begin modeling was the time required for set-up. I used to have a separate space for the hobby, but in smaller apartments it is quite impossible to reserve any space for a single purpose. 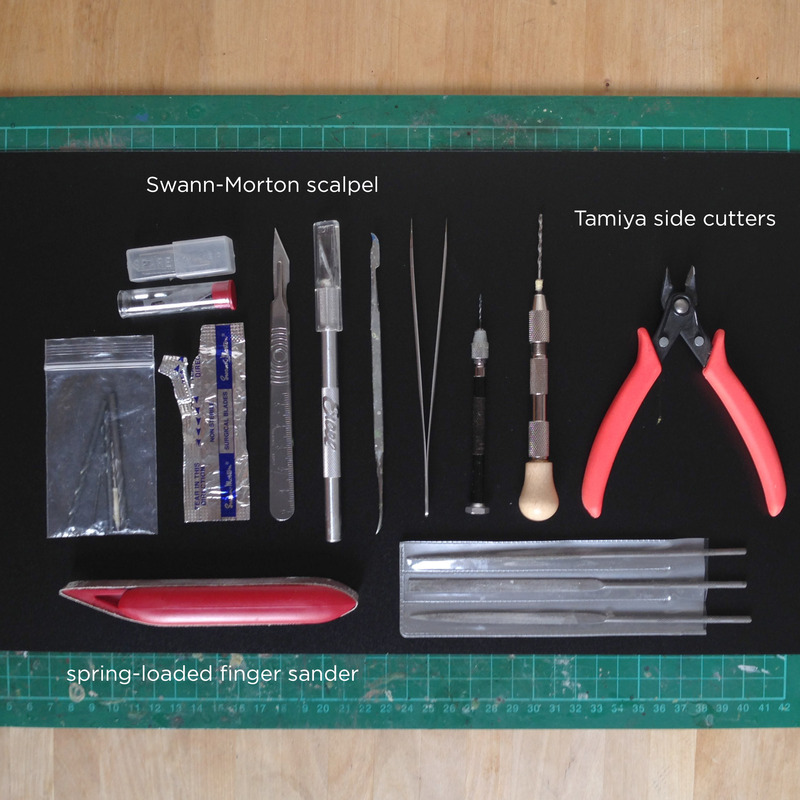 The usual routine began with clearing out the kitchen table (it is never clutter-free), unpacking boxes of tools, paints, and models onto it, and then assembling a workspace out of the unsorted paraphernalia. Then get some lamps, a pot of water, make a palette, get some music playing, and you’ve already wasted half an hour without opening a single can of paint. I’m sure you get the problem. So little by little, I started to reduce. 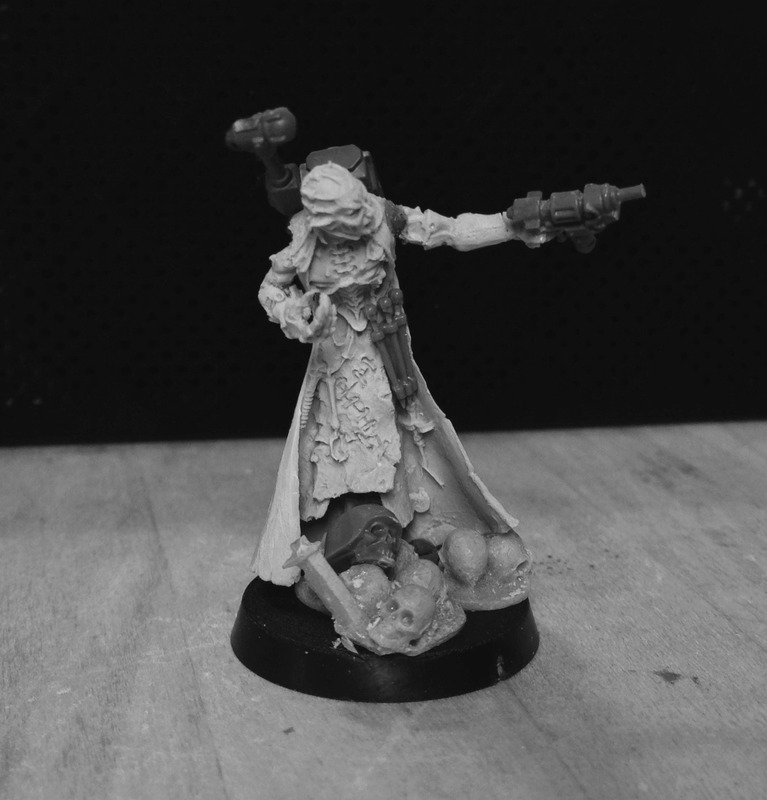 Reducing the time and space wasted by the hobby requires tiny changes in everything you do. There is no magic push-button solution, and it will never be perfect. Enjoying the process and applying an analytical curiosity to details, however, makes it really fun! – you don’t need all of the bitz..
Before you ask: Yes, this is all of it. The most important parts of the system are the modest plastic boxes from Biltema. I picked them because the stores are omnipresent in Finland so I can always get more, and you can find the same boxes under different brands (orange ones from Clas Ohlson) elsewhere too. Everything is sorted in boxes. On the left hand side I have my tools, painting set on the top, and converting under the lid. In the other large box I have tank parts and terrain features. The four smaller boxes are bitz; Marines, Humans, Mechanicum, and Other. The paints sit on IKEA cd-shelves, just because that is what our landlord has decided to furnish our flat with. Obviously the toolbox is the most important sub-collection. 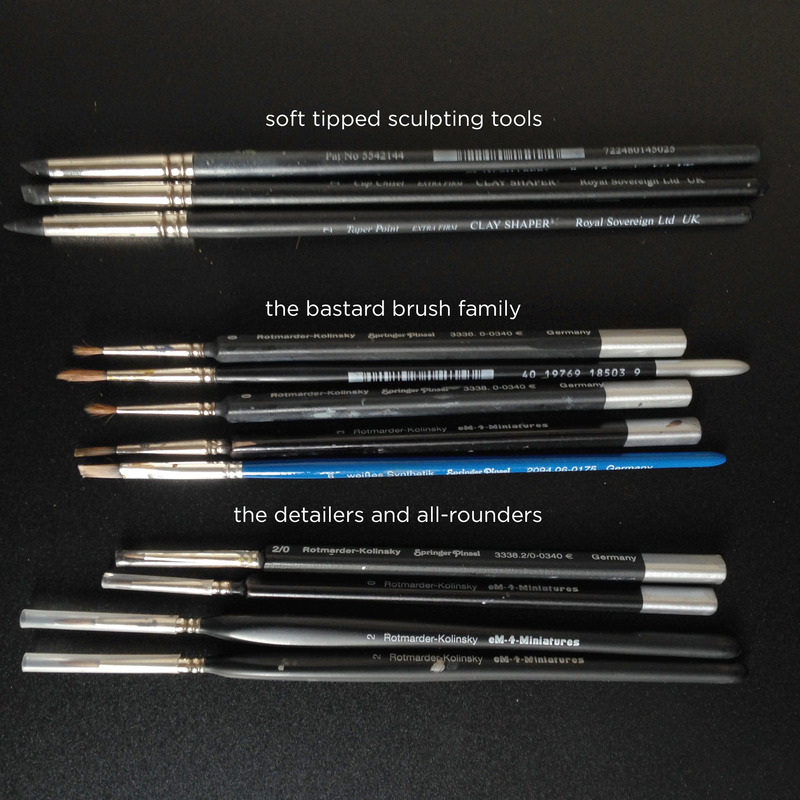 I usually have the brushes on top with a pair of side-cutters and files, because these tools get used most often. Under the lid you get more cutting tools, a couple drills, and all of the sculpting stuff. The weathering powders are mostly there just because that is where they fit..
Each of these tools I can heartily recommend. The side cutters and scalpel are kind of premium precision tools, that never get used in any ‘heavy-duty’ cutting. For the more violent stuff I just use the cheap craft knife with lots of spare blades. It helps to keep the precision tools in shape. Most of my painting is done with the size 2 brushes, which I need two of because the other one is backup. Same goes for the detail 2/0 size brushes. So there we have it. It’s not the amazing altar of Migs’ hobby corner, but for this life situation it works. I can convert a dinner table to hobby corner in under five minutes, so there is really no excuse not to. Of course I hope to one day have both space and time, so expect another paradigm shift in the coming years.. I would love to hear about your approaches as well. Oh and the post would not be complete without a teaser of things to come..
Good post, and a subject close to my heart. 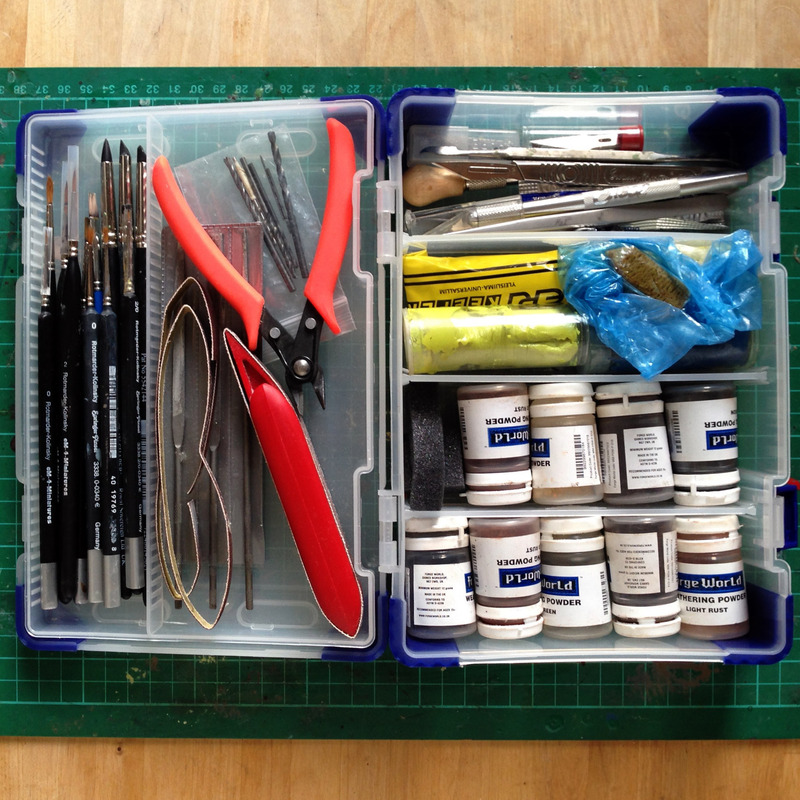 I have to say, I’m a big fan of my geedub hobby box – a gift from my lovely wife. Add a box system for bits and I’m good to go in no time. Just as well because the only table in my house gets used for everything! Most bitz are good for trading, so they don’t need to be ‘thrown away’ literally..
Great post! Having just moved into my first two bedroom apartment I dreamt of a whole hobby room to myself, but with a housemate to help pay the bills I’m left with a small half desk in the living room. Not that I mind, it’s got just the “essentials” as you mention, with only one project at a time set up. I now find myself doing more in a couple of hours one evening than I would have in a whole weekend with everything laid out! The motivation comes from within, and I know find myself glancing at a model over breakfast only to spend the whole day looking forward to painting it in the evening after dinner 🙂 keep up the great work! The sleepy breakfast miniature glance is an established habit! 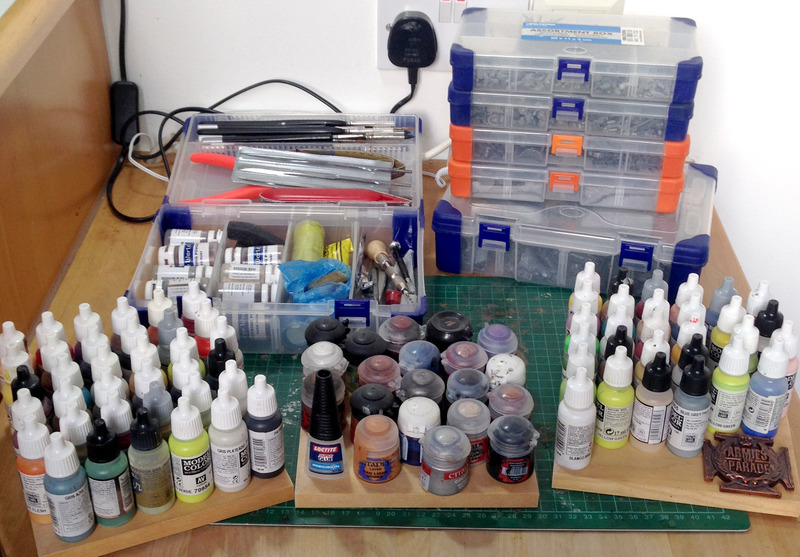 I rather enjoyed your blog post detailing hobby spaces and the table too, it’s an interesting part of the action. Cool article – living in a one bed flat is west London myself I can relate to this. I’m always being accused of ‘hobby creep’ by the gf as my models and projects take over the dining table, on top of the cabinets, boxes under the coffee table and in the wardrobes! There’s some great hobby hacks here that I’ll definitely adopt. Wasting time is my worst enemy, and as you say, you can spend a lot of time without achieving anything. Great advuce here to make every minute count! Nice one Toni! And very similar to my life 7 or 8 years ago. I would add that the “Shrine” still exists for much the same values. Super fast access to even 15 minutes of action between life 🙂 Proof in a few minutes, as I am finally uploading the Martians. we are back in the noosphere! Man I wish too to find them in the UK. Once you’ve committed to a certain box size and type the choice to expand with something else is an extremely reluctant one.. Even though these ones arent beautiful they’re super practical. I found a few that are being marketed by Draper in the UK http://www.drapertools.com/category-products/3710/Organisers plus Amazon seems to have them for sale too. Would never have found them if it wasn’t for your post in the first place! Previous Post 100th Iron Sleet post! Next Post Vlka Fenryka – Hjolda! He is alive!